Innovative - reliable - robust! The principles of our corporate philosophy are high quality products at affordable prices as well as a customer-focused service. Our inverter power generator DQ-2200E contributed to our successful company history as it has set the upper standards in mobile power generation with its innovative features. Convince yourself by all the advanced characteristics specified down below. Datasheet of the DENQBAR Inverter power generator DQ-2200E to download. All Inverter power generator at a glance. At DENQBAR there is currently a reason to celebrate - we have been awarded as "Best Brand of the Year 2018" in the category "Generators"! This has been adjudged by the independent jury of the Plus X Award, the most well-known quality and innovation award for technology in Germany. Only well-deserved and proven brands enjoy an appreciation. In the areas of quality, functionality and ease of use, this award represents an important unique selling point compared to the products of other competitors. 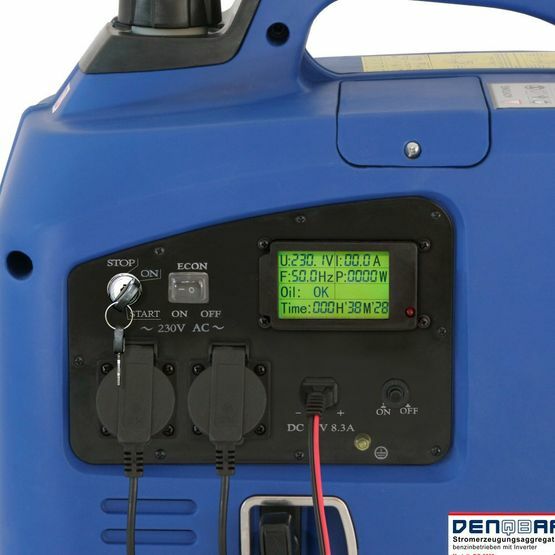 With a DENQBAR inverter power generator you are making an excellent choice! 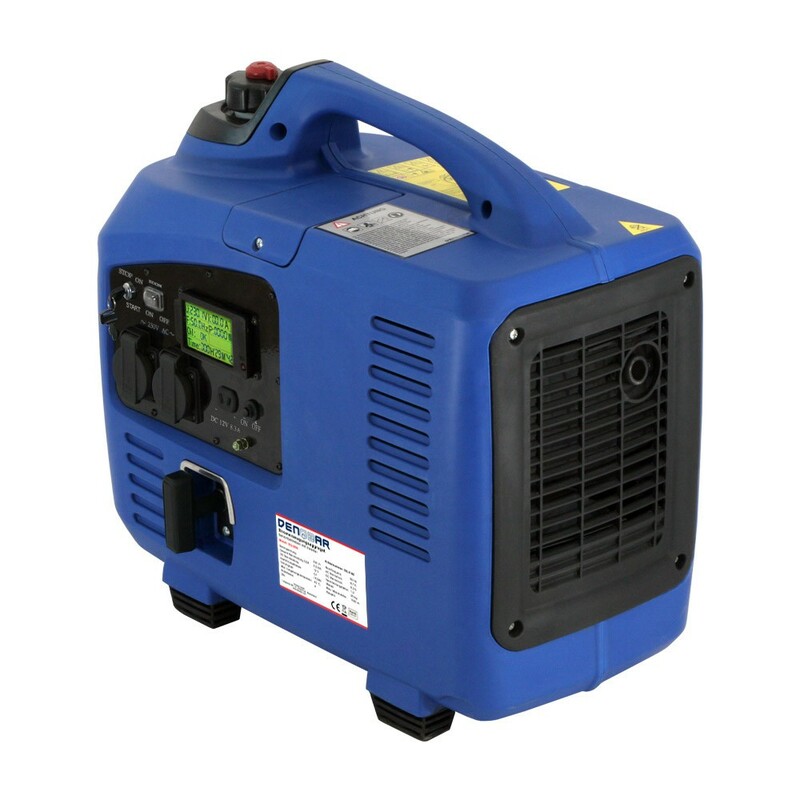 Choosing this inverter power generator implies buying the highest quality at a more than fair price. For good reason, DENQBAR was awarded "Brand of the Year 2018". This seal of approval is the highest quality award given by the independent jury of the Plus X Award. For each category and year, only one company is awarded, whose products won the most awards in the respective category. Due to this unique feature, the inverter power generators by DENQBAR are differentiating in terms of quality, functionality and ease of use from those of other manufacturers. Try this excellent high-end device and let us convince you! Choosing a DENQBAR inverter power generator means choosing the top league in mobile power generators. Especially the equipment of the DENQBAR generators leaves nothing to be desired. The technical refinements include a clear LCD display, informing you about all important details at a glance, such as the voltage delivered, the current output or the total run time. Due to the backlight you are always well-informed about the current features of your power generator - even under the nocturnal sky. Inverter describes a modern technology that guarantees a pure sine wave output. A significant advantage over conventional power generators with unstable voltage isn't it? The DENQBAR Inverter power generators reliably transform direct current into alternating current, and therefore always deliver perfect frequency and voltage. In particular, sensitive devices like laptops, TVs, microwaves, freezers or music systems can be connected without hesitation due to the electronical part (PCB) inside the generator. Conventional power generators have another crucial disadvantage: they are very noisy. But with high quality Inverter power generators by DENQBAR, you do not have to worry about that anymore. Due to the enclosed housing and its effective sound insulation, our models impress with their quiet operation. With the built-in eco-mode, the engine speed is adjusted automatically according to the amount of the power required, which reduces fuel consumption and noise level as well. Therefore, our devices are ideal for use during a camping holiday or an open-air event, since you do not have to be afraid of a disturbing noise. All our generators are equipped with a very special feature. The innovative eco mode optimally adjusts the engine speed based on demand or at full speed. This results in a more efficient operating mode, as it lowers fuel consumption as well as the amount of exhaust gas emitted. You do not only save money, but also reduce the environmental impact. Especially in times of global warming, our inverter power generators have an invaluable advantage over conventional generators. Quiet, economical & environmentally friendly - Good reasons for DENQBAR! Transporting our mobile DENQBAR inverter power generators is pleasantly easy, so you can use your electrical devices even when there is no wall socket. That's why we consistently use extra lightweight materials. In addition, the compact design and the ergonomically shaped handle ensure easy transport of this model. Enjoy this flexibility! This reliable inverter power generator virtually is a socket to-go! This inverter power generator from DENQBAR has enough power to supply multiple loads simultaneously. Especially useful when needing more than one device: no more arguing on what shall be connected first, as you can now use two Schuko-sockets at the same time. In this case, you do not need to decide on what to do first: Watching TV or letting the kids use the laptop. 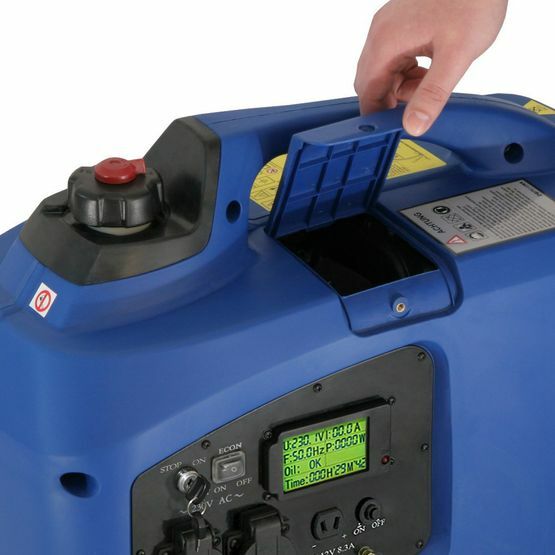 This smart generator also features a 12V DC socket. With its special cable, it is particularly suitable for charging batteries. There are probably numerous situations in which you will benefit from this practical application. For example, charging car batteries - a reassuring feature, especially in remote areas. However, even owners of RC racing cars as well as aeromodelling enthusiasts have already discovered the advantages of mobile inverter power generators by DENQBAR. Not being dependent on fixed wall sockets and therefore enjoying liberty of getting electrical power anywhere and anytime, means using a DENQBAR inverter power generator. The handling of our high-quality power generators is just as luxurious and comfortable. In addition to the informative digital display, the overload and oil shortage protection and the ease of transport, the battery-powered electric start has to be highlighted. Starting has never been easier: Just turn the ignition key and use your mobile power station! With the branded products by DENQBAR you rely on high quality and longevity. Therefore, we have equipped all our mobile power generators with a standard overload protection as well as an oil deficiency indicator, which protect the engine sustainably against damage and power losses. If the oil level drops below the minimum, a fuse triggers the automatic shut-off of the device. Therefore, your DENQBAR inverter power generator will be able to provide its full performance potential - always and everywhere! Whether you are looking for relaxation in the campsite, refurbishing your boat in the harbour, having an open-air party with your friends or needing electricity for hobby gardening: With this inverter power generator, you always have your personal power plant aside. But probably nothing is as badly predictable as the weather. Fortunately, the whole generator meets ingress protection level IP23 (Protected from water spray less than 60 degrees from vertical.) - and its Schuko sockets are even protected from water spray from any direction with IP54! Therefore, you do not need to panic about a few rain drops striking the generator. The editors of the "Do-It-Yourself" magazine "selbst ist der Mann" tested the DENQBAR DQ-2200E as part of their "self-tried" category and awarded it the highest grade "very good" with 5 hammers. 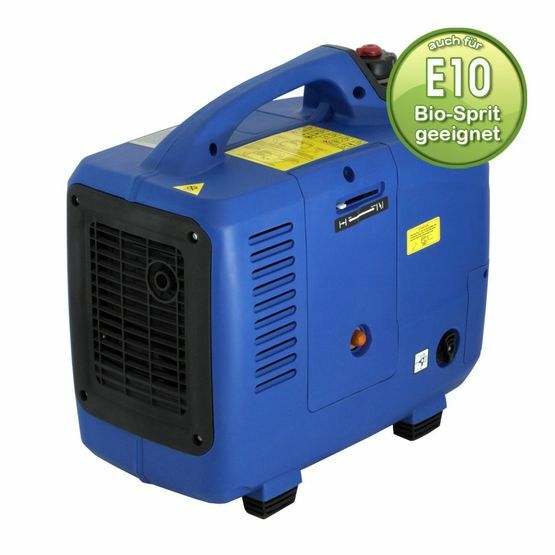 The conclusion was: "Low cost, relatively quiet generator with enough power for home improvement applications. Inverter for sensitive consumers. Disturbance prevention with integrated oil level sensor." - published in the issue 10/2014 and on selbst.de. 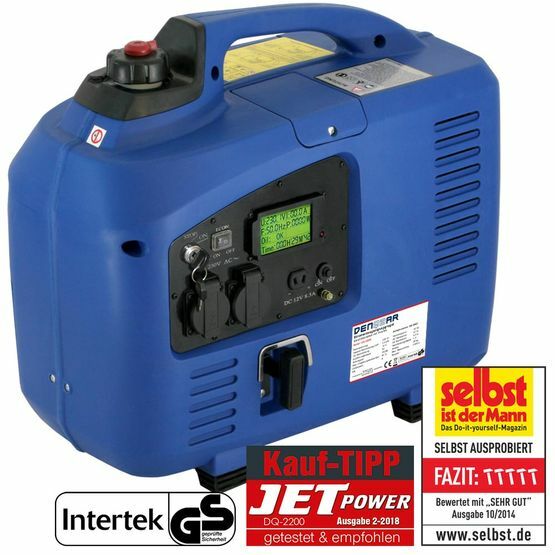 There are countless possibilities for using a mobile inverter power generator in aeromodelling, like charging batteries or using notebooks, soldering irons, multifunction rotary tools or even 3D printers. A good reason for the editors of the JET POWER magazine to take a closer look at our DQ-2200E.It has been all-convincing in categories reliability, applications, power and smoothness. Conclusion: the DENQBAR power generator is clearly recommended for purchase! The Plus X Award is one of the best-known and most important quality and innovation awards for technology in Germany. That is why it fills us with great pride as DENQBAR has been honoured as "Brand of the Year 2018" in the "Generators" category. With this seal of approval, the independent jury confirmed the consistently high quality and functionality standards of the DENQBAR Inverter generators, which are also known for their ease of use. "Geprüfte Sicherheit" (Tested Safety) - The GS mark confirms this product to be safe, legally valid and of high quality. We have voluntarily subjected our product to a stringent quality control by an independent licensed notified body. This certification has been awarded by Intertek with the Certificate No 17SZS1882-01. Discovering the world with a mobile home radiates the charm of individuality, adventure and liberty. For you not experiencing any unpleasant surprises in remote areas, a mobile inverter power generator by DENQBAR should always be on board! These generators perfectly mix safety and comfort and are practically designed to run high-quality appliances without risk or charging batteries. TV sets, satellite receivers, freezers, etc. are among the most voltage-sensitive electrical appliances. If certain tolerance values are exceeded by conventional power generation, severe damage is partially inevitable. DENQBAR's DQ-2200E digital inverter power generator reliably transforms DC into AC, providing the necessary voltage stability. With a maximum output of 2.2 kW and a simultaneous economical and low-noise operation, this handy tool is not only interesting for all outdoor enthusiasts! In addition to all the attractive features already provided by the DQ-2200, the DQ-2200E has a battery-powered electric start function. Even more than an advantage in ease of use!